Drop In to Lil Griz Cub House! Is to build a foundation of knowledge and skills within a nurturing environment. An environment that promotes self-confidence, encourages a love for learning, and celebrates each child’s individuality! Our classes run for three hours and consist of Circle Time, Centers, Music, Story Time, Large and Small Group, and Outside Time. Our play-based curriculum allows children to learn through first-hand experiences designed to encourage and stimulate your child’s imagination, as well as physical, social, and emotional development, while providing excellent opportunities for intellectual exploration. Our classroom is composed of six different activity centers. These centers include Art and Writing, Discovery, Reading, Sensory Table, Blocks and Building, and Dramatic Play. Each center is designed to encourage your child’s natural curiosity through hands-on learning and opportunities for creative play. In addition to classroom learning experiences, we also take several field trips throughout the year to explore and learn all about our community! Click here to find out more about the amazing staff at Lil Griz. 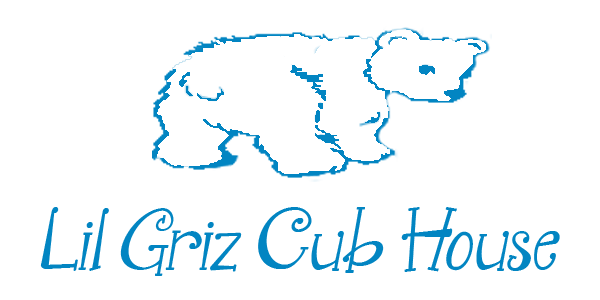 Are You New to Lil Griz Cub House Drop Off Center? Please download the form below, and fill it out before you bring in your child.